For most of my life, I’ve enjoyed reading. During college, reading for fun got placed on a back burner. Like, a burner way back in the back. And on a different stove. But that was due to being so busy and having other things that called for my attention. And I’ve been reminded of how much fun reading actually is. In reading, we can be taken to and explore a different world. We can interact with new people. We can go on fantastic adventures and make memories with fantastic characters. We can experience things in new or different ways. 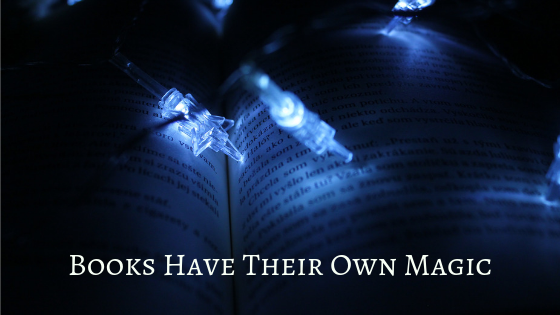 But there are even more reasons why I think there’s magic in books. We can meet new people because of the stories we love. My best friends have some of the same favorite series as I do (Middle-Earth and Harry Potter, for example). And we’re able to bond over that. So reading can introduce you to some pretty great people who can end up being some of your best friends. Books can get us through some pretty difficult times. I’ve heard this said by other people, especially concerning the Harry Potter series. But I know that some of the books I’ve read recently have helped me to some degree. And I think that’s because I can relate to one or more of the characters and/or what they’re going through. And I think that’s part of what draws us in. Books can hold memories. I still have many of the books I read when I was younger. And I’m talking books from my single-digit and preteen years. But I don’t want to get rid of those books. Not yet anyway. And the reason why is because they hold special memories for me. And they remind me of who I was when I was growing up. There are so many other good things about books, and I might get into those in a later post. But I definitely think that reading should become common again. What do you find magical about books and reading? Comment below! Thank you! And I agree! There is something truly special about books!